Democrats are set to include a pro-gay marriage plank in their convention platform for the first time in history, party sources confirm to POLITICO. The language was approved unanimously by a 15-member platform draft committee, and now heads for approval by the full platform committee in August. The party’s Platform Drafting Committee agreed, unanimously, to approve the language at a meeting this weekend in Minneapolis. The language will not become official until the party’s full Platform Committee meets Aug. 10 in Detroit. The effort to include gay marriage in the platform gained increased momentum after President Barack Obama announced in May that his views on the issue had changed to support legalization. Roger Kimball is Editor and Publisher of The New Criterion and President and Publisher of Encounter Books. He is an art critic for National Review and writes a regular column for PJ Media at Roger’s Rules. He has written and edited several books on art, literature, culture, politics, and education. He recently spoke with Catholic World Report about his most recent book, The Fortunes of Permanence: Culture and Anarchy in an Age of Amnesia, published by St. Augustine's Press, offering his thoughts on relativism, tyranny, culture, religion, Chesterton, art and architecture, socialism, and the future of Western civilization. Catholic World Report: In the Preface, you write that the "embrace of relativism was a harbinger, a symptom of a seismic shift in the way people view the world." What was that seismic shift? And how did it set the stage, so to speak, for the rise and growing acceptance of relativism? Kimball: Perhaps the best way of identifying the nature of that shift is to quote Dostoyevsky’s famous observation, from The Brothers Karamazov, that “If there is no God, everything is permitted.” Dostoyevsky’s great insight was to see that without allegiance to the transcendent, our parochial attachments are anchorless, and, being anchorless, they tend to drift along whichever way the current of sentiment pushes them. As I note in Fortunes, relativism, whether or not it travels under that particular name, has more and more assumed the status of a civil religion in the West. It bearing the promise of liberation from old pieties—just think back to the rancid jubilations of the 1960s and 1970s if you want an example—but regularly delivers new forms of tyranny and enslavement. That’s to say, while the first upsurge of relativism can be an intoxicating draught—think again of the giddiness that ushered in the Sixties—the unpleasant hangover, the foundering on the jagged shoals of reality—is not long in coming. What seemed like a welcome liberation soon reveals itself as a vertiginous exile. Which is to say that, at bottom, relativism is a religious problem. “God is dead,” Nietzsche proclaimed in the 1880s. What he observed was an emotional, not an historical, fact. The unspoken allegiance to something transcending the vicissitudes of human desire had been (among the elites, anyway) shattered. The result was nihilism, that existential vacuum which human nature abhors and rushes to fill with a panoply of brazen idols and false gods. Catholic World Report: An interconnecting theme in the book is how relativism informs a number of modern impulses and trends, including those of tyranny, utopianism, and benevolence. Many people, it is safe to say, think those three have little or no connection at all to one another. How are they connected? Why do many people fail to see the relationship between them? Brandon: Outside the Bible and Catechism, what are the top five books you wish every Catholic would read? Peter Kreeft: Augustine’s Confessions, Pascal’s Pensees, Frank Sheed’s Theology and Sanity and Society and Sanity, and Brother Lawrence’s The Practice of the Presence of God. All of them bring heart and head together to powerfully push the reader up the road to the meaning of life, which is to be a saint, in head, heart, and hand. The Confessions is unclassifiable; it has everything. The Pensees is the best modern apologetic book. Sheed’s two classics are the clearest popular introduction to Catholic theology I know. And Br. Lawrence’s is the simplest and most effective book for beginners in the spiritual life. Those who are prone to conspiratorial explanations of phenomenon tend to be, well, a little bit crazy. And, their craziness is not only intellectual, it is moral. How else to explain this bizarre article at the Catholic World Report anout the "Nuns on the Bus" tour being linked with financier George Soros. Soros, you see, gave money to the Center for American Progress. The Center for American Progress played a role, not clear what role from this diatribe, in the foundation of the group Faith in Public Life. The group Faith in Public Life apparently was one of the groups that the nuns at NETWORK met with when the idea of having a bus tour was hatched. Q.E.D. Sr. Simone might as well have been caught sitting in Soros' lap! And all for the sake of publicity! The horror. Except that, in a democracy, publicity is not a bad thing, is it? What is so different about the bus tour from the pamphlet "Common Sense"? And, in American democracy today, the idea of trying to garner publicity for the plight of the poor by means of a bus rental is almost quaint, at least when compared to the gobs of money making its way onto the airwaves via the SuperPACs. And, so what if Sr. Simone had cashed a check direct from Soros? Where did this demonization of Soros begin? I may not agree with all of his politics, but the man has used a considerable amount of his considerable fortune to promote civil society and democratic norms and independent journalism in the countries ravaged by Communism. Is that such a bad thing? I deplore some of his positions, especially his support for euthanasia, but that cannot undo all the good he has done. Ignoring the good, and only emphasizing the bad is, tarring everyone with an association with an indictment, this sort of conpiratorial think is, as I say, crazy. Folks can read my post and judge its level of intellectual and moral craziness for themselves. For my part, I'm unclear what Winters means by "moral craziness"; is he actually accusing me of a specific depravity, evil, and sin? Or inclination to the same? (I know he believes in sin: it is any action or thought issuing forth from what he calls "Catholic neo-cons".) Perhaps I missed the memo about going easy (as the mainstream media does) on an atheist billionaire who has been convicted of insider trading in France, and who supports a number of dissenting, progressive Catholic groups, some of which are openly pro-abortion, such as Catholics For Choice. And how, for goodness sake, does my post qualify as "conspiratorial"? Especially since Soros's political and social stances are fairly well-known and his support of causes and groups in opposition to Church teaching and authority are equally evident? Ecology, Politics, and "Love of the Home"
Nuance is often lacking in discussions about global environmental crises, which makes Roger Scruton’s Green Philosophy: How to Think Seriously About the Planet (Oxford University Press) a gift for those distraught by the doomsday scenarios or outright denial voiced by many today about life on Earth. Scruton’s examinations of agriculture, climate change, widespread plastic pollution, and much more offer sound, challenging food for thought—even if the necessary ingredients to achieve his proposals are left largely unstated, as people of faith will notice. Scruton is an English writer and philosopher. He labels himself as conservative but his writings and observations can defy the commonly accepted meaning of that label. In How to Think Seriously About the Planet one finds solutions that would, and do, delight liberal ecological crusaders. This is but one example of Scruton’s willingness to seek answers along any path that will do. In just over 400 pages, the book connects topics that should be connected when discussing ecology: politics, philosophy, aesthetics, economics, sociology, the natural sciences, history, and current events. What is hardly mentioned, however—and when it is, only with the lightest of touches—is faith, especially the Christian faith that Scruton has adopted and that formed the foundational narrative of much of the Western world that he examines. Perhaps Scruton assumes that his audience will be largely secular and so wishes to avoid any terminology—like sin, grace, or God—that may interfere with, or be diminished by, his political message. Nevertheless, love and sacrifice play big roles in this book. The central proposal for thinking seriously about the planet is “old-fashioned oikophilia”—the love of the home. It is this love, Scruton argues, that provides the best means to counter human-induced ecological crises. Any changes in human practices that are meant for the good of the environment (and, thus, for people) must root themselves in our “individualist” instinct for communities to tend to their own. The opposing “egalitarian” reflex—to solve problems through the actions of strangers within centralized governments, international agencies, or non-government organizations, of which no one political authority is in control—will too often fail and in many cases already has. It is hard not to hear a dialogue with Christian ethics in Scruton’s definition of political action. Indeed, much of what Pope Benedict XVI has said about ecology and human consumption aligns with Scruton, when stripped of political adjectives. But Scruton’s musings about conservative political philosophies do not journey into faith, even if this is where the entire project seems headed. The Eucharistic celebration is a testament to the need for man’s self-gift as response to God’s gift to us through his Son …. to find himself through his own, sincere gift of himself … reflected in his total consecration to God through an earthly marriage. Jefferson’s view of the First Amendment has become authoritative. That is a problem, because Jefferson did intend to promote religion’s exile from public life. As the bishops make clear in their statement on religious liberty “Our First, Most Cherished Liberty,” the HHS mandate declaring that Catholic institutions must provide contraception and abortifacients in their insurance coverage is only one of a number of attacks by the secular state against the Church. Why the attacks? Surely the state would declare that it is merely following the dictates of the First Amendment’s Establishment Clause, which demands, so the Supreme Court tells us, that the federal government “erect a wall of separation between church and State.” Ushering religion out of the public square so that one sect doesn’t set up shop to the exclusion of others and thereby commandeer the government to do its bidding—well, that’s the government’s ordained job. Freedom of religion for everyone demands that no religion gain privileged access, and so all must be kept on the other side of the wall of separation. So we’re told. The encyclical, Humanae Vitae, was promulgated 44 years ago today, on July 25, 1968. The word often used to describe Pope Paul VI's encyclical is "prophetic". It is one of those rather rare cases in which such a daunting, loaded, and strong adjective is exactly on the mark. Being prophetic, in the biblical and apostolic tradition, involves far more than some sort of foretelling of future events. It is, first, a forthtelling of truth, a proclamation of the Word of God. As such, it requires courage and a willingness to be rejected, mocked, and even vilified. All of that happened to Paul VI, and the case can be made (and has been made many times over) that Humanae Vitae and the immediate response to it—harsh, mocking, dismissive, angry—marked a pivotal moment in the Church's life in the modern era in the West. There was talk then, as there is even today, that the deep divide over the teachings of Humanae Vitae and the subsequent, related teachings by Blessed John Paul II and Benedict XVI might lead to a divided Church. But viewing it in such a way is rather misleading because, first, the Church is One, and as such, cannot be divided into two (or more) bodies. "Unity", the Catechism of the Catholic Church reminds us, "is of the essence of the Church" (par 813). There are wounds to the unity of the Church, and these take the form of "rifts", "serious dissensions", "ruptures", and "heresy, apostasy, and schism" (par 817). It's hardly a news flash, of course, that there are many who have separated themselves from full communion with the Church because of Paul VI's clear teaching that contraception is sinful and contrary to God's plan for marriage, procreation, and family life. I have no doubt that many Catholics who use contraception are ignorant of what the Church teaches—and why she teaches it. Yet there are those who knowingly, willfully, and without shame insist that they and their convenient (and supposedly perfect) consciences have found the Church's teaching to be inadequate, inconvenient, and incorrect. Taken to its logical, if not altogether comfortable, conclusion, this approach assumes that God himself upholds the dissent founded upon their (poorly formed) consciences. Continue reading ont the CWR blog. Saint Ignatius, formerly a soldier, converted to a deeper Catholic faith after he was injured in a battle. During the time he was recovering, he read a number of religious books on the life of Jesus and the saints. These books inspired Saint Ignatius to devote his life to Christ. He went on to found the Society of Jesus (the Jesuits) and wrote his powerful and widely influential work, Spiritual Exercises. July 31 marks the Feast of this beloved saint. 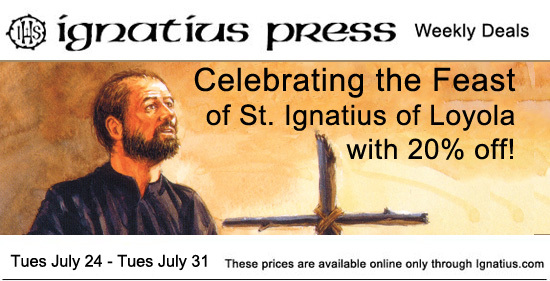 In celebration of his life and his writings, as well as writings from other Jesuits, Ignatius Press is offering 20% off on the Spiritual Exercises DVD, the Do It at Home Retreat book and more! Many 19th-century promoters of contraceptives were religious zealots who first attacked marriage, then procreation. Today, Catholic apologetics against contraception and abortion sometimes appear historically naive, as if these issues suddenly fell out of the sky in 1930 with Resolution 15 of the Anglican Lambeth Conference on contraception, or in 1973 with Roe v. Wade. A little information about the early history of contraception and abortion advocacy in America—especially its deepest objectives—might help. The Catholic Church has vast resources to deploy as long as it understands its opponents well. And one important thing it should understand is that many of contraception and abortion’s early proponents were religious enthusiasts. The first public advocacy of contraception was not explicitly religious. It came in the form of a pamphlet by a self-defined “freethinking” materialist—a Massachusetts physician, Charles Knowlton, who wrote and published The Fruits of Philosophy in 1830. As a young man, Knowlton had been upset by the very fact of his nocturnal emissions and had gone to a handyman and electrical tinkerer in the neighborhood who administered shock treatments for his “condition,” to no avail. Knowlton took a fancy to the electrical tinkerer’s daughter, married her, and found that his “problem” immediately was cured. Later, after conducting some private research into anatomy while studying medicine, he wound up in jail for nocturnal grave robbing, or as he put it, “depriving a parcel of worms of their dinner.” Dr. Knowlton, although he fancied himself to be among the illuminati, would seem to have been something of a creature of the night. "No social movement gets a special dispensation from history..."
For decades now, sociologists and other experts have built up a library’s worth of evidence about the toll of this human experiment. Yet a great many sophisticated people deny that this record exists and excoriate anyone who so much as points his thumb at it. This is uncannily reminiscent of what happened during the Cold War, when an impressive number of sophisticated people across the West reacted to Communism . . . by attacking anti-Communists rather than Communists. Of course in retrospect, everyone can see that Communism was exactly what the anti-Communists said it was: an experiment with enormous costs. Nobody disputes that anymore, not even all those anti-anti-Communists who spent their days defending or rationalizing the thing. The point is that as it turned out, a lot of sophisticated people were wrong all along about a pretty important issue that turned out in retrospect to be a no-brainer. That’s where the comparison to denial about the legacy of the sexual revolution comes in. Right now, those who might be called the “anti-anti-liberationists” are running the show. In retrospect, though, they’ll be the losers in this debate, just like the anti-anti-Communists were yesterday, and for the same reason: because the facts aren’t on their side. I think that evolution is happening already, in fact. Just look at the recent article in the New York Times, all about how being married or unmarried is a decisive factor not only in income inequality — married people are financially better off — but also, the author dares to suggest, in children’s overall well-being. LOPEZ: Given the seminal event the introduction of the contraceptive pill was, and the ubiquitous nature of contraception in American lives, is turning back the clock, as they say, realistic? EBERSTADT: The vehemence with which people say that the clock can never be turned back on the sexual revolution is pretty ironic. Just think of all the times you heard that phrase during the debates over the HHS mandate — or the one about not putting the genie back in the bottle, or not ever returning to the 1950s, etc. All these clichés are shorthand for one word: inevitability. A lot of people for a lot of reasons want to claim that everything about this revolution is now a permanent fact of life, off-limits for contrarian interpretation. And what’s really interesting about that embrace of the idea of inevitability is that history has shown time and again that human beings just don’t operate that way. As Karl Popper showed in The Poverty of Historicism, history is not, in fact, on the side of movements claiming inevitability for themselves. Just ask the Communists . . . if you can find any. No social movement gets a special dispensation from history, no matter how badly some people might want it to. Human beings are not only moral creatures but also rational ones, at least collectively and over time, and the empirical record about the dark side of the sexual revolution will eventually make a dent. As mentioned, I think it already has made one. Read the entire interview, "Pill Buzz Kill" on the NRO site. The vital importance of holy, Catholic family life in helping a young man to discern the call to priesthood and all that may follow from that call, including even becoming the Pope, is at the heart of this book-length interview with Msgr. Georg Ratzinger. Midway through the sympathetic interview, conducted by German journalist Michael Hesemann, Pope Benedict XVI’s elder brother cites the Ratzinger family itself as the key ingredient that influenced his and his brother’s decisions to become priests. “It was clear to me from the beginning — although serving at the altar and, of course, perhaps more than anything else, the spirituality of our family had something to do with it — that I would go into ministry.” Young Joseph Ratzinger later followed his brother into the diocesan seminary, and the two have been intimate blood brothers and brothers in the Lord ever since. Msgr. 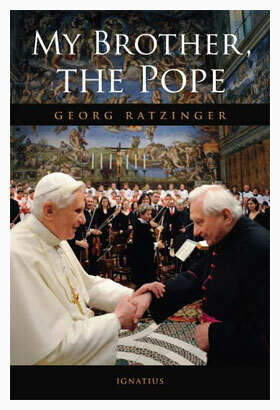 Ratzinger, who became a famous choir director in Regensburg, Germany, is known to have an extraordinarily accurate and detailed memory, which shows itself in various colorful descriptions of the homes, towns, churches and schools where the family lived out their Catholic spirituality. The monsignor displays in his depictions just how Bavarian spirituality, like all solid Catholic spirituality, is earthy, grounded in reality, sacramental, beautiful and joyful. Read the entire piece on the Register's site. Catholic families have a right to know which theology professors have the mandatum, and Catholic colleges and universities should require it as a condition for employment, affirmed the Vatican’s chief judge Cardinal Raymond Burke in a new report prompted by recent concerns from Pope Benedict XVI. Cardinal Burke and several bishops, canon law experts, and theologians discussed the mandatum with The Cardinal Newman Society in an online report published today at www.cardinalnewmansociety.org. As implemented by the U.S. bishops, a theology professor requests a “mandate” (commonly identified by the Latin mandatum) from the bishop presiding over the diocese where the theologian is employed. The professor commits, in writing, “to teach authentic Catholic doctrine and to refrain from putting forth as Catholic teaching anything contrary to the Church’s Magisterium,” according to U.S. guidelines. But in the United States, many Catholic colleges and universities have not required theology professors to have the mandatum, or even to disclose to students and their families which professors have the bishop’s recognition. The 1990s saw vigorous opposition to the mandatum by some theologians and the Association of Catholic Colleges and Universities, but the controversy has since cooled down, largely because in practice the mandatum has not had much relevance to students and college leaders. Now Pope Benedict’s concern about a lack of “compliance” with Canon 812 renews questions about Catholic colleges and universities’ obligations relative to the mandatum. The Cardinal Newman Society asked several experts including Cardinal Burke, archbishop emeritus of St. Louis and prefect of the Supreme Tribunal of the Apostolic Signatura, the Vatican’s highest canon law court, to explain what canon law requires. It’s tangible in the sense that it’s a public declaration, in writing, on the part of the ecclesiastical authority that a theologian is teaching in communion with the Church, and people have a right to know that so that if you, for instance, are at a Catholic university or parents are sending their children to the Catholic university, they know that the professors who are teaching theological disciplines at the university are teaching in communion with the Church. They are assured in that by the public declaration of the diocesan bishop. A review of Robert Spencer's Did Muhammad Exist? An Inquiry into Islam's Obscure Origins. A similar series of works have appeared that attempt to work the same kind of radical historical revisionism on the early history of Islam, focusing on the person of Muhammad and the text of the Qu’ran, including Karl-Heinz Ohlig and Gerd-R Puin’s The Hidden Origins of Islam, Hans Jensen’s Mohammed: Eine Biographie, and an entire body of work by Ibn Warraq. 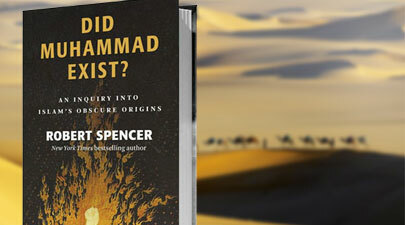 The present work under consideration, Robert Spencer’s Did Muhammad Exist? An Inquiry into Islam’s Obscure Origins (ISI, 2012) is the latest and perhaps most provocative of these books. "The Confessions: Augustine's First Treatise on Grace" – Joseph T. Lienhard, S.J. "Confession, Prayer, Transformation" – Allan Fitzgerald, O.S.A. David Vincent Meconi, S.J. situates the reader with the introductory essay. Sr. Maria Boulding, O.S.B. (1929 - 2009), born in Liverpool, was linguistically gifted and theologically astute. Turning down a full scholarship to Oxford, she joined the cloistered Benedictine Nuns at Stanbrook Abbey in September of 1947 where she unceasingly labored for 62 years. She spent much of her later life translating the writings of St. Augustine. Fr. David Vincent Meconi, S.J., editor of Homiletic & Pastoral Review, is a professor of patristic theology at St. Louis University where he teaches courses on Trinitarian theology, Christology and soteriology in the early Church, with a special interest in the life and thought of St. Augustine of Hippo. He is also the co-editor of the Cambridge University Companion to Augustine. Good and regular spiritual direction can help us work through some of the natural and dangerous currents in the spiritual life. By trusting God to redirect us and keep us afloat, he will help us navigate back to the solid ground of God’s presence. As a priest, who has been involved in the ministry of spiritual direction for more than half of my 33 years as a priest, I believe that the joke is on us. Although there are many reasons why priests do not continue in spiritual direction after ordination—i.e., time and availability of spiritual directors, to name a few—I am convinced that seeking out and receiving regular, one-on- one, spiritual direction is a graced relationship, worthy of our time and trust. I would like to begin with a personal story that can serve as a paradigm of how regular, in-person, spiritual direction can act as a relational life preserver for us who are drawn, here and there, by the demands of contemporary ministry and the challenge of relationships. Once, while vacationing on an Island in the Atlantic, I was informed that a hurricane was on a direct path toward the island. The next morning, I decided to go to the beach early, taking in some sun and bathing in the ocean, before the storm made landfall. That decision almost cost me my life. I learned, especially, to respect riptides: a strong current, opposing other currents, running parallel to the seashore. I let go. I stopped swimming, letting the tide carry me closer and closer to the rocks. Ten yards from the rock formation, the riptide suddenly let me go. I was free to swim ashore. In a city shaped by immigrant communities, beautiful historic churches reflect the faith and hard work of generations of Catholics. Chicago is known for its many beautiful and historically significant buildings, not the least of which are its Catholic churches. In the city there are about 365 Catholic churches, which for nearly two centuries have invited the faithful to come and worship their Creator. This summer, I took a tour of four of these churches in what were originally Polish neighborhoods with Nell Andrzejewski, director of Catholic Church Tours. She refers to Chicago as “Little Rome” because of its many churches built in the old European style. As various immigrant groups came to the United States, they moved into often modest neighborhoods and built grand churches, which would serve as a hub for their communities. And while the ethnicities of these communities would change over time, their houses of worship would endure. Here are profiles of these four churches, followed by suggestions from Nell and CWR readers of others that are well worth a visit.